I received these fab Estée Lauder products a while back . Estée Lauder was kind enough to send me their new Enlighten range and some new makeup releases as well. Let’s start with the Enlighten range first. I’ve been using the dark spot correcting Night Serum every morning and night on clean skin before applying the Even Skintone Correcting Crème. After 1 month I’ve noticed that my skin looks a bit more radiant and even. I now have to use less of the EE crème correction éclat parfait. It’s not that my skin has changed so dramatically that my close friends are noticing it, but I notice it in the mornings when I look in the mirror with no makeup on. The other great side effect is that my makeup tends to apply better and looks more natural on my skin. Even though the serum is supposed to be a night serum, I also use in the morning. It’s a non-greasy serum which absorbs quickly into the skin without making your forehead look like a shiny bowling ball ! the Even Skintone Correcting crème is a hydration cream which works well with any foundation which you apply afterwards because it absorbs quickly into the skin. That’s the main reason why it’s become my go to crème in my professional makeup kit. The EE crème correcting correction éclait parfait with SPF30 is one of those cool products which looks green/white , but when you apply it on the skin in circular motions, it starts looking more foundation like. I’ve been using my MAC fiber brush to apply this product. Let’s talk makeup ! Makeup gets me excited … so when I saw the famous little black primer, I couldn’t wait to try it and … I love it. I had so many questions: will it clump when over layering another mascara? Will it elongate my lashes? Will it make a difference? 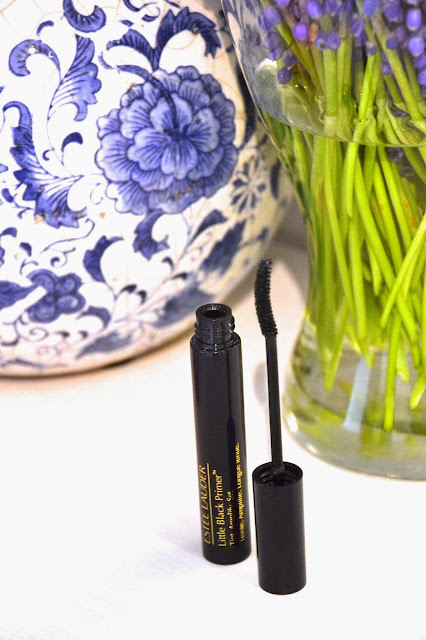 I have fairly blond lashes, so applying the little black primer gives an immediate elongating effect . I do have to use a brush to separate the lashes after using the primer and before applying the finishing mascara. It gives an dramatically full effect which I love. A tip that I would want to give : use your eyelash curlers before applying the primer! The Double Wear Stay-in-place Eye pencil are ah-mazing! I received the colors ‘Pearl’ and ‘Gold’ . 'Pearl' will be your best friend if you’re looking for a great, creamy, inner eye color which will brighten your look and make you look more awake . I’ve also used 'Pearl' as a under brow highlight color (soften it a bit with fingers after applied). 'Gold' is such a pretty color to use as a eyeliner in combination with bronzed skin and green or brown eyes. Ik ben heel benieuwd naar deze producten, klinkt in ieder geval goed! Wat een mooie producten zeg! Ik heb zelf nog niks geprobeerd van Estée Lauder tot nu toe, shame on me! Prachtige producten! Ik ben echt helemaal verliefd op alles Estée Lauder dus dit vind ik echt wel leuk eruit ziend! Ooh super! Ik was al langer benieuwd naar de nieuwe skincare en vind hun make-up eigenlijk altijd wel top.